Our range of expertise also include binding machines, which cater to a wide array of industries. 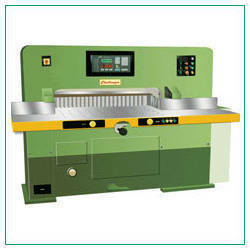 The binding machines are all designed to deliver accurate results with easy operation facilities. All our binding equipment is provided with safety devices. These machines can be easily installed with minimum space requirements. Hence our range of binding machines not only enhance the production capacity but also provide a safe and spacious work area. Our range of binding machines include hydraulic fully automatic paper cutting machines. This machine is designed by our experts for enhanced performance. It helps to enhance production and saves time and labor needed for production. We also manufacture high speed fully automatic paper cutting machines. 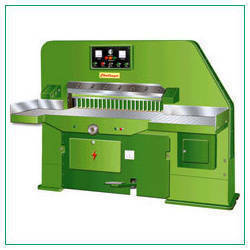 These machines are designed to enhance the production capacity and speed. The machine delivers accurate results and has programming facilities available. It can be easily installed and safely used for high performance. The operation is easy it has fully automatic operation. Two hand push button for safe cutting and enhanced operation. Looking for Binding & Paper Cutting Machine ?